In 1996, the pink pound obviously didn’t stretch too far, as the Gay Times website was shared with the lesbian magazine Diva. Fun on the site was limited to sliding block puzzles. For the ladies, a Gillian Anderson, and for the gentlemen a River Phoenix. 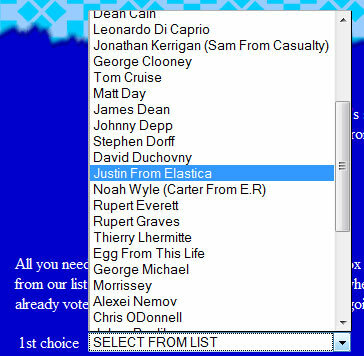 The “vote on our list of horny hunks” feature throws up some very unexpected people. Justin from Elastica, Martin Rossiter, Tim Vincent and Egg from This Life. Then there is one entry which, whilst he is many things, a “horny hunk” – really? “Talk about a Red Wedge” Julian Clary, The British Protest Song Awards 1993. This entry was posted on July 19, 2010 at 10:34 am	and is filed under Gay Times. You can follow any responses to this entry through the RSS 2.0 feed. You can leave a response, or trackback from your own site.